I used different cardstock colors, ribbon, etc. And, I used some white Liquid Applique for the snow. I also added a dog in front of the dog-house. He comes from the Loads of Love Accessories, and I simply colored and cut-out one of the 3 dogs. The "a very merry Christmas to you" stamp is a level 1 hostess stamp set, Best Yet. 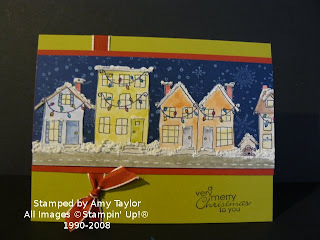 The houses are watercolored with Classic Stamp pads and an Aqua Painter. I just love those Aqua Painters. The ribbon is Riding Hood Red Taffeta ribbon.